At AlwaysFreshFish.com we use only farm raised Rainbow Trout from the United States. The Rainbow Trout that we offer for sale come directly to our plant from the farms already filleted, there will be small "pin bones" on the interior of the fish which are not noticable after cooking, and with it's head on. 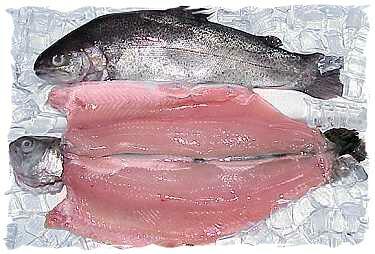 Rainbow Trout has a delicate meat, pale brown to almost white in color. Rainbow Trout has a flaked mild meat which makes it a very popular fish. Your Rainbow Trout will average between 8-12 ounces per fish. 1 lb. Fresh Rainbow Trout + 4 lbs. Add. Selections = 5 lb. Total Order OK! Rinse Rainbow Trout fillets under cold water and let drain. Dredge Fillets in flour shaking off excess flour. Dip Fillets in Egg mixture. Dip fillet side only in sliced Almonds being sure to coat evenly. (being careful not to burn Almonds) and cooked through. For additional information on Fresh Rainbow Trout, please e-mail AlwaysFreshFish.com.